LG has received a patent for an inward folding smartphone. The patent shows a large smartphone that folds in half. It also reveals some features LG may be planning for a potential foldable phone. The United States Patent and Trademark Office has granted LG a patent for a foldable smartphone. 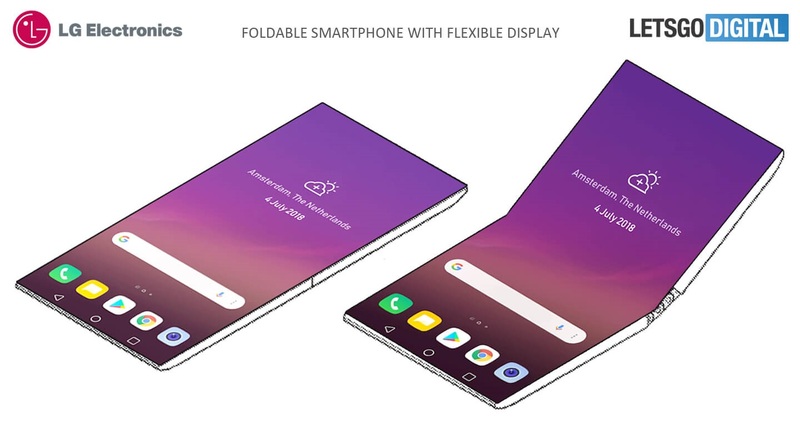 The patent, which was granted on June 28 and discovered by LetsGoDigital (via Phone Arena), hints at some features LG could be planning to include in a foldable phone. The device shown in the patent looks like a large version of a regular smartphone that would fold vertically. This is similar to designs in Samsung patents seen earlier in the year, though it differs from the tablet-like the one seen in LG patents from 2017. The bulk of the patent focuses on the hinge mechanism which moves apart as the device folds and could help prevent damage to the display. The patent also mentions that the phone would be held shut by magnets and that the display would turn on automatically when the hinge is open. The most interesting details, however, come later in the document and relate to potential features. The patent states that users will be able to use the camera with the display off. In one of the diagrams, the phone is shown in a users shirt pocket with one half of it sticking out. This suggests LG could be planning a feature that would let users record hands-free videos from their perspective; perhaps in a similar way to Snapchat Spectacles or a GoPro. The patent also shows how the folding mechanism could allow the phone to be placed in various positions. Users could, for example, fold the phone into a v-shape to stand it up when taking pictures. Alternatively, it could be folded only slightly and stood horizontally when watching videos — an experience that would be supported by stereo speakers also mentioned in the patent. We haven’t heard much from LG about its folding phone plans but with Samsung potentially releasing its foldable device early next year, there’s a chance LG might do the same.